In a big-city test of the “Fight for 15” movement, 100 Chicago precincts vote “yes.” Wage hikes are a potent issue that could swing the Illinois governor race. Even as they re-elected Governor Chris Christie last fall, New Jersey voters gave landslide support to a measure that not only raised the state minimum wage to $8.25 an hour but indexed future increases to keep up with inflation. 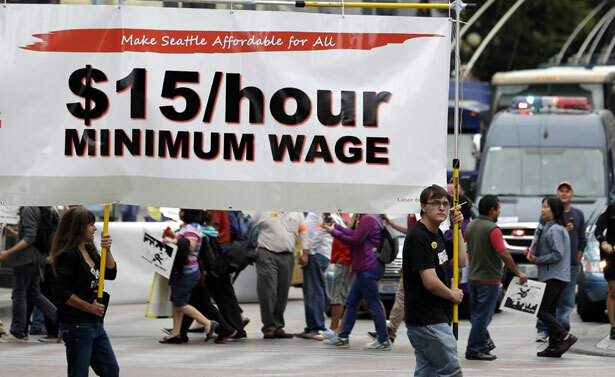 On the same day, voters in Sea-Tac, Washington, approved a $15 hourly wage, while voters in Seattle elected socialist Kshama Sawant on a “Fight for $15” platform. When voters in the city went to the polls to cast ballots in Tuesday’s statewide and local primary elections, thousands of them faced an economic question: Would they support a $15-an-hour minimum wage for large employers in the city? A growing number of localities across the country have already enacted minimum wages significantly above the federal and state level in an effort to address the impact of low-wage job growth and growing inequality throughout the post-recession recovery. Cities and counties that have enacted higher minimum wages in recent years include San Francisco ($10.74 per hour), Santa Fe ($10.66 per hour), San Jose ($10.15 per hour), Washington, DC ($11.50 by 2016), Montgomery County, MD ($11.50 by 2017), Prince George’s County, MD ($11.50 by 2017), and SeaTac, WA ($15 for certain occupations). The Chicago vote also offers an insight into why Illinois Governor Pat Quinn has been making the minimum-wage issue central to his re-election run. Quinn is a Democrat who has a long history of working on issues of concern to low-wage workers and the communities where they live. But he also knows a winning issue. Rauner, whose GOP primary win was a narrow one, has been all over the place on the wage issue. He said early in the campaign that he would lower the state minimum wage from $8.25 an hour to the national rate of $7.25 an hour. Reports that one of the wealthiest men in the state was promising to cut wages for working Illinoisans did not go over well, and Rauner then suggested he might support raising the state rate if economic conditions were favorable. Quinn has been far clearer when it comes to discussing wages—saying he favors an increase to at least $10 an hour this year—and the broader issue of economic inequality.